The sinister characters “Men in Black” (MIB) have, with minor variations, appeared to many UFO witnesses, usually warning them not to report their UFO sighting or experience. Typically, MIB are dressed in black, pristine but old-fashioned suits and hats with white shirts and they quite often travel in threes. Often they have been reported to have been wearing wrap-around sunglasses and when they are not, have been reported to have oriental features with slanted eyes. Strangely, their mode of transport is reported to be a Cadillac or other prestige model of car which looks brand new but has long been out of production! The vehicle’s license plates, when checked, invariably turn out to be false or unissued numbers. MIB often resemble humourless G-Men, may be able to produce some form of I.D. or claim to be from a “Government Department”, claiming to have detailed knowledge of a person’s life – a “We know all about you” attitude. In deed there is no doubt that on occasions MIB have been in possession of information and there was no explanation as to how they obtained it. Often they know of a UFO experience before the witness has had the chance to discuss the event with anyone else. It is a commonly held theory that MIB represent part of the alleged government cover-up of UFO incidents and official knowledge of them. Despite numerous reports of UFO witnesses being threatened or intimidated by MIB, there seems to be no evidence of these strange beings actually following through with their threats. However, possibly this should be expected, perhaps retaliation by these mysterious people is not in the manner of a 1940’s gangster movie but using techniques much more applicable to modern day. In the current era of computers, Digital technology etc… perhaps MIB can exact revenge from behind the scenes, namely the removal or tampering with a person’s personal records in such a manner to discredit or cause great difficulty in day to day living. According to most accounts, MIB’s date from the 1950’s onwards. However, during my research for a book, which I co-wrote with Jon Downes, (The rising of the Moon…Domra Publications 1999) I came across a certain ,small news story, which ,ay just prove that this particular type of occurrence may have happened long before that!. Part of my research was to scan microfilm records of my local paper, the Exmouth Journal. It was during these searches that I came across a story, tucked away on the side columns of the front page. I cannot say what it was that caught my eye about this article, but, the more I read it the more I could not believe my eyes!. A strange story was told the Yorkshire Post, Grimsby correspondent by workmen from killingholm near Immingham new dock works on Tuesday night. They declared that they were seated at noon on the roadside at killingholm, when a large motor car drove up and two men alighted who walked to the bank on which the workmen were seated and asked if any airships had been recently seen near. The workmen replied: “No” whereupon the motorists asked the distance between killingholm and Spurn, and whether any mines were laid in the Humber between the two places. The workmen referred their interrogators to a coastguard, saying he would be able to answer them. “It does not matter,” replied the motorists, and, after enquiring the way to the nearest refreshment house, they jumped into their car and drove quickly away. It must be remembered that this area was the scene of UFO reports at this time, so, what are we to make of this queer story? Well for my money, this reads as a MIB report. However, I suppose it is a matter of how you read it! If this is indeed a MIB report from that time, then we in the UFO community must reconsider our view of the MIB problem. If they date from such an early time, then by having another look at early reports, perhaps we can find more of these mystery visitors in our past. What would this mean to our prescribed views on the whole UFO mystery? Who knows? Still, it is a very interesting idea, I am sure you would agree! Research Bureau closed down by MIB – U.S.A.
One of the earliest reports of intervention by MIB occurred in Connecticut in 1952. Albert Bender launched “The International Flying Saucer Bureau”, the first major UFO research group. However, the bureau was closed down after only 18 months after his family was threatened by three MIBs who demanded he stopped his research. Albert Bender - threats forced him to close down his research bureau. Nameless MIB – Cumbria, U.K. In May 1964, fireman James Templeton and his wife took a photograph of their daughter at a remote marsh near Carlisle, Cumbria. When developed the photograph showed a man in a spacesuit seemingly floating in mid-air behind their daughter. Soon afterwards the Templetons were visited by two men wearing black suits and driving a black Jaguar car. “They were very strange, asking peculiar questions about the weather and behaviour of animals. Although they claimed to be from the government, they never used names and referred to one another just by numbers. I drove out with them to the marshes but they seemed to get upset when I insisted that I had not seen anybody as I took the photograph. They drove away, stranding me alone to walk five miles home. I never heard from them again”. The photograph taken by James Templeton - a "spaceman" appeared in the background! Strange visitations – Tripp Pond, Androscoggin County, Maine, U.S.A.
On 27th October 1975, David Stephens (21) and his friend Paul (18) had a long encounter with a UFO which involved “missing time” and afterwards the realisation that they had “orange” eyes. “Better keep your mouth shut if you know what is good for you”. He then left in a hurry. Stephens approached Dr. Herbert Hopkins (Psychiatrist) and after discussing his UFO experiences underwent hypnotic regression which revealed a standard abduction scenario during the period of missing time. During the abduction Stephens underwent an examination which involved the use of a black box-like device. On 11th September 1976, Dr. Hopkins, whilst at home alone, received a telephone call from someone claiming to be a UFO investigator, asking if they could visit him. “Destroy all of your records on the abduction case”. “My energy is running low, must go now”. The MIB then fumbled his way to the door. Dr. Hopkins did not quite realise just how bizarre his visitors’ behaviour was until he had left but was later very disturbed by the experience. On 24th September 1976, Dr. Hopkins’s son John and his daughter in law Maureen received a visit at their home by a man and a woman, both dressed in old-fashioned clothes and both seeming to have problems walking properly. During this the man kept “pawing” and fondling the woman in a uncomfortably intimate manner, asking John if he was doing it correctly. The strange man also asked Maureen if she knew how she was made and if she had any photographs of herself naked! After only a short visit the couple announced they had to leave, which they did without saying goodbye but not without making it perfectly obvious that they were capable of walking only in dead straight lines. Intimidation and threats – Charleston, South Carolina, U.S.A. Throughout the 1970s there were frequent UFO sightings in the vicinity of Charleston. Some of the witnesses complained of being visited and threatened by what they supposed to be “government agents” but the truth of their origins was never determined. One case involved a successful television journalist who witnessed and successfully photographed several UFOS. However, due to threats from unknown quarters, this person flatly refused to disclose his identity. One of several photos taken by a television journalist who felt too threatened to reveal his identity. In another instance, a young motor mechanic called Bill Herrmann witnessed and photographed UFOs on several occasions. On March 17th, 1978, Bill Herrmann left his house at around 9-30p.m. 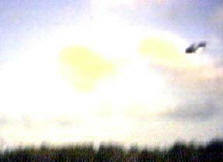 in order to get a better view of a bright light which was hovering over electricity pylons near a local air force base. Bill was shocked to find himself in a field to the south of Charleston (approximately 15 miles from his home) some 3 hours later. Deputy Sheriff Pike Limehouse was called to the scene and found Herrmann in a very excited and distressed state; Herrmann suspected that he had been abducted. He certainly could not account for the “missing time” or explain his being 15 miles from home. [ left ] Bill Herrmann - his UFO experiences were of great interest to "MIBs". On another occasion Herrmann was driving to church one Sunday morning when a UFO shot across the road and then continued to follow a peculiar “triangular” flight pattern. Herrmann had succeeded in obtaining a number of good quality photographs of the objects he had sighted and the following day at 3-30 p.m. he received a call from the local air force base asking him to let the information officer have the photos. Herrmann drove to the base at about 5-30 p.m. but was told that the information officer was not on duty. However after twenty min utes or so a Captain King arrived on the scene and demanded, via the guard, that he hand over the UFO photographs. Herrmann refused but did give then one photo and received a receipt. Herrmann did receive further “menacing” messages from the base telling him he had, in fact, photograph ed a “Phantom” aircraft. [ left ]One of many UFO photos taken by Bill Herrmann. One of the photographs [ right ] taken by Bill Herrmann that was of such great interest to the strange visitors. A short time later Herrmann received a telephone call from a certain “Tom Olsen” who claimed to be a UFO investigator from Maryland. He asked to meet Herrmann and when he arrived he produced identification from “The UFO Information Retrieval Centre”. Herrmann then went with “Olsen” to the locations where the UFO photos had been taken. At this stage Olsen asked Herrmann if he would agree to take a polygraph test. Herrmann did consent to the test but was surprised to find that it was to take place immediately – in a secluded room at a local luxury hotel (Room 520 at the Mills Hyatt House Hotel). Room 520 of the Mills Hyatt House Hotel - Herrmann was subjected to a polygraph test in this secluded hotel room. When they entered the hotel room there were two other men present, one of whom claimed to be a member of a “polygraph association”. The other said he was a doctor and proceeded to inject Herrmann with a relaxant. Herrmann became very relaxed and the doctor then asked him a number of questions regarding his UFO sightings for approximately sixty to ninety minutes. Herrmann, however, felt exhausted and insisted that they take him home. “I wouldn’t bet on it”. click on picture for larger size A week after these events Herrmann received a message from Thomas M. Olsen of Maryland asking for copies of his photos and including a questionnaire. At this stage it became evident that the man who had previously called himself Olsen was, in fact, an impostor. The real Olsen sent a mailgram to Herrmann categorically denying that he had ever visited him. click on picture for larger size Strangely, a UFO investigative team, who later spent several hours interviewing Bill Herrmann, received a series of inexplicable telephone calls at the hotel they were staying in and a friend of Herrmann, who substantiated his claims, also received intimidating telephone calls both at home and at work (via his boss). Tony Martin - a friend of Bill Herrmann's - he received several threatening telephone calls. lkley Moor – Yorkshire, U.K.
At dawn on 30th November 1987, a former policeman was taking photographs on Ilkley Moor when he noticed a strange “entity with a green cast” some distance ahead. The next thing he remembers is finding himself in the nearby village of Menston in a confused and disoriented state. He immediately had his film developed and discovered that he had actually photographed the “entity”. The e former policeman sought help from a UFO investigator who took his report very seriously and they decided to secretly investigate the photograph thoroughly. About six weeks later the former police officer received an unexpected visit from two men, who claimed to be R.A.F. Intelligence Officers. They flashed I.D. cards and gave their names as Jefferson and Davis. Their mission, they explained, was to recover the photograph he taken on Ilkley Moor. What mystified the very few people who were involved in the investigation was how these strangers knew about the photograph as they had not discussed or revealed details of it to anyone else. When asked, RAF Intelligence declared that they had no knowledge of the two men and they did not exist. A strange humanoid [ above ] photographed by former police officer on Ilkley Moor. More MIBs – Raeford, North Carolina, U.S.A.
On 27th June 1992 at about 12-30a.m., a noise like a passing freight train rattled the trailer where Mrs. Diane Messing lived with her daughter. Previously, the outside lights of their and the neighbour’s homes had suddenly failed and the Messings decided to go outside and investigate what was happening. When they stepped outside the Messings saw what appeared to be a bright fire burning in a wood which was located in a hayfield about 100 yards from their home. The “fire”, however, proved to be a spherical object about 5 yards across with orange windows; it was entirely silent. After approaching the object quite closely the women decided to call the sheriff’s office but when six deputies arrived the object had vanished. However, the outside lights were working again and the following morning an examination of the scene revealed an area of grass that had been flattened, swirled and discoloured. The incident attracted the attention of UFO investigators and amongst these the Messings were visited by a man who claimed to be a military officer. This man was described as being “creepy” and his questions proved to be distinctly odd and at times irrelevant. Despite attempts to do so his identity was never established . In April 1996, Luiza Silva, mother of the girls who first witnessed the second creature, was visited by four strangers - none of whom were Brazilian. The four men, dressed expensively, offered her a large sum of money to persuade her daughters to lie about their encounter. When Mrs. Silva refused, the men left in a blue 1994 Lincoln Continental car - they promised to return.